Description: Paradise Cruises launched their first vessel in 2008. However, the foundations of the company were laid a few years ahead with the building of the bridge linking Tuan Chau Island to the main land and the ensuing possibility to bring passengers to a private pier, a service never yet offered by cruise companies of Halong bay. 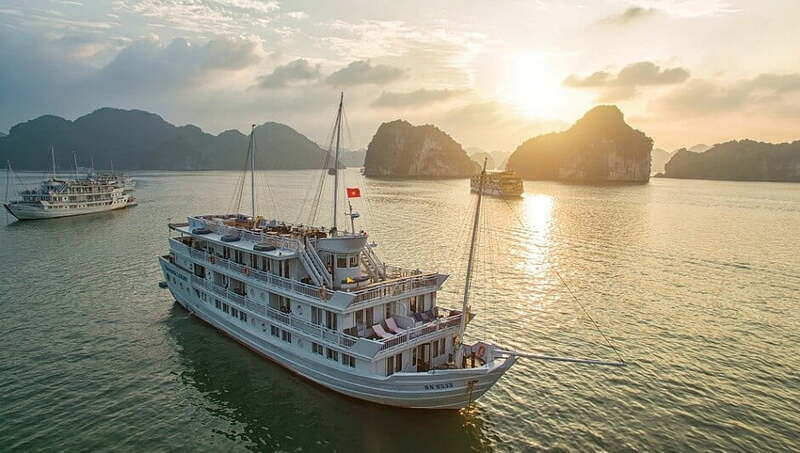 The concept of the company came along, to offer a unique cruising experience in the World Heritage site, blending Vietnamese traditions and multi-faceted culture with the highest standards of hospitality worthy of world-class grand hotels and, thanks to visionary ideas and unequalled customer services, standing out among the four or five hundred boats sailing across the bay every day. After four years of careful planning and cooperation with Vietnamese and Western architects, designers and consultants, Paradise Cruises launched their first boat, Paradise Luxury I, in November 2008, soon followed by Paradise Luxury II in March 2009. 8.00: Pick up from hotel in the old quarter of Hanoi by Paradise Luxury Cruise shuttle bus. 12.00: Arrive at Tuan Chau Island. 12.15 – 12.30: Transfer to Paradise Luxury cruise. 12.30: Welcome Cocktail, cruise briefing, safety instructions, check-in cabins. 12.45: Depart to Halong Bay, cruise and program commence. 13.00 – 14.30: Fusion Asian/International Lunch Buffet. 15.00: Arrive at Cua Van floating fishing Village. One of the largest floating villages in the bay – rowing around the village by local rowing boats – captures the daily life of the local fisherman. 16.00: Back to Paradise Luxury Cruise, continue cruise through Halong Bay. 16.30: Enjoy the cooking demonstration and discover the Vietnamese cuisine. 17.00 – 18.00: Arrive at Tung Sau (Pearl Farm) area – relax at leisure, enjoying our beauty and massage service or swimming, kayaking. 19.00 – 20.30: Elegant five courses set menu. 21.00 – 23.00: Evening activities: relax at leisure, enjoy movie night, board games, or beauty spa services. Stay overnight on the Paradise Luxury Cruise. 06.30: Tai Chi session on sundeck. 06.00 – 08.00: Morning activities – swimming or kayaking, beauty spa services. 07.00 – 09.00: International breakfast buffet. 08.00: Surprise Cave (Hang Sung Sot) – explore most famous grotto in the entire Halong bay. 09.30: Check-out and settle bills. 10.45: Arrive at Tuan Chau Island. 08.00: Pick up from hotel in the old quarter of Hanoi by the Paradise Luxury Cruise shuttle bus. 16.00: Back to Paradise Luxury Cruise – Continue cruise through Halong Bay. 17.00 – 18.00: Arrive at Tung Sau (pearl farm) Area – find out a full cycle of how the pearls are created or swimming, kayaking, enjoying massage service. 19.00 – 20.30: Elegant dinner with five courses set menu 1. 21.00 – 23.00: Relax at leisure. Evening activities: enjoy movie night, board games, or beauty spa services. Stay overnight on the Paradise Luxury Cruise. 07.00 – 08.30: International breakfast buffet. 08.15: Transfer to Paradise Explorer, our day trip boat. Depart to Cat Ba Island. 10.00 – 11.00: Arrive at Viet Hai Jetty, take bicycle or motorbike trip through untouched forests and wildlife. 11.30 – 12.30: Enjoy village scenery or take steep hiking trip up to Navy Peak (Dao Hai Quan). 13.00 – 13.45: Return to Paradise Explorer and depart from Viet Hai Jetty. Vietnamese set lunch menu on day boat. 14.00 – 15.00: Arrive at Dark Cave and Light Cave area, relaxing, swimming or snorkeling. 15.15 – 15.30: Return to Paradise Explorer and transfer back to Paradise luxury Cruise. Relax at leisure. 19.00 – 20.30: Five courses set menu 2. 21.00 – 23.00: Evening activities: enjoy movie night, board games, or beauty spa services. Stay overnight on Paradise Luxury Cruise. 06.00 – 08.00: International breakfast buffet. 08.00 – 9.00: Surprise Cave (Hang Sung Sot) – explore most famous grotto in the entire Halong bay. 10.45: Arrive at Tuan Chau Island & disembark.